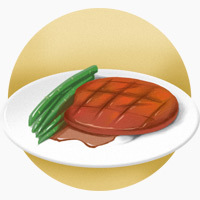 Paleo is big on meat, but not just any meat. Take a look at what “grass-fed” actually means (it’s not the same thing as organic! ), why it’s nutritionally superior, and what you can do about the cost. Before getting into the benefits of grass-fed meat, it’s important to pin down what we’re talking about. “Grass-fed” means exactly what it sounds like: the cow ate grass (and sometimes other grasslike things, like alfalfa – other stuff that you would naturally find in a field and that the cow would naturally eat). This sounds like a completely ridiculous label: don’t all cows eat grass? What else would a cow eat? Actually, most cows raised in the US start their lives eating grass, but when it comes time to fatten them up for slaughter, they’re moved to barns where they live inside and eat grains, not grass. The vast majority of cows in the modern food system do not actually eat grass for their whole lives. It’s profitable for the farmer. Grains are more calorie-dense than grass, so they make the cow grow to slaughter weight faster (just like people, cows gain weight fast from eating grains!) This saves the farmer a lot of money, so profits go up. It’s cheap for the consumer. The farmer passes down some of the cost savings to you, the person buying steak at the grocery store. There’s consumer demand for grain-fed meat. 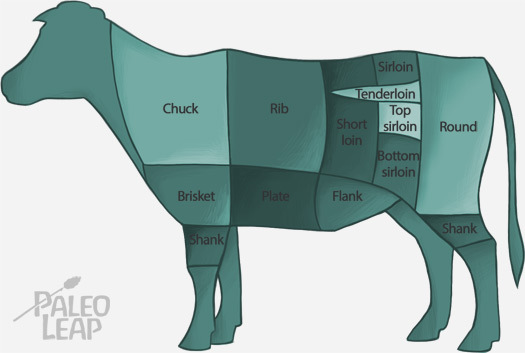 The meat from grain-fed cows is typically quite fatty and very mild-tasting, and people are used to that taste now. Many consumers don’t want the actual taste of beef from a cow that ate grass. They want their beef mild almost to the point of being bland. “Grass-fed” is not the same thing as “organic.” Organic meat can come from grain-fed cows, as long as the grain was organic. Some beef is both organic and grass-fed. But they’re not the same thing! All beef is nutritious, but grass-fed beef is significantly more nutritious than grain-fed. Grass-fed beef is the only kind of beef that contains conjugated linoleic acid. Grain-fed beef has none. Conjugated linoleic acid is a type of fat that might be very important for preventing weight gain. Grass-fed beef has better fat quality. Specifically, it has significantly more anti-inflammatory Omega-3 fats and significantly fewer inflammatory Omega-6 fats. This is something to take with a grain of salt, because the absolute amount of both types of fat is quite low. Grass-fed beef has much more vitamin K2. Vitamin K2 is important for heart health and bone health: it helps get calcium into your bones (where it belongs) and not into your arteries (where it causes plaque and heart attacks). Grass-fed beef has more antioxidants, especially vitamin E.
If you don’t want manure in your drinking water, you support grass-fed meat (well, or veganism, but if you’re reading this, you’re probably not a vegan). Grain-fed meat is wrecking our water supply. It starts with the fields where we grow the corn that feeds the grain-fed cows: this kind of intensive farming depletes the soil of nutrients. We’re destroying the only place we have to grow our food. So we dump fertilizer on it…but the fertilizer runs off into our lakes and rivers, makes the water unsafe to drink, and kills all the fish. The actual farms where grain-fed cows are even more destructive. Grain-fed cows don’t just live on pastures while eating grains. They live in huge, filthy barns called CAFOs (Concentrated Animal Feeding Operations). With all the cows cooped up in such a small space, CAFOs end up with a lot of manure to deal with, often manure full of antibiotic-resistant “superbugs.” And that manure is constantly spilling out into the water supply. This contaminates water and makes it unsafe to drink. Grass-fed beef can go a long way towards addressing these problems – there’s obviously no need for huge fields of corn, so the fertilizer problem totally goes away. And since the cows are spread out and not crowded into filthy barns, they don’t need constant antibiotic treatment, so they don’t get antibiotic-resistant superbugs. Also, the manure is more manageable when the cows have more space to live. Of course, there are other environmental reasons to oppose factory farming. And there are even more reasons that fall under the general heading of “what you do affects other people, so vote with your dollars.” For example, one other huge problem with factory farms is antibiotic resistance. Did you know that the vast majority of antibiotics used in the US go to farm animals? Drug resistance starts on the farm, not in the doctor’s office! You could fill several books with all the reasons why factory farming is awful for the environment. But that would probably be overwhelming and exhausting – take water as an example case, and if you really want to know more, here’s a place to start. You can make an ethical argument that eating meat is justified. But it’s almost impossible to justify treating cows the way they’re treated in factory farms. The Rolling Stone recently did a great expose of animal abuse on factory farms – and how people who try to expose cruelty are being forcibly silenced. Warning: do not read that if you’re eating, or if you’re particularly sensitive to violence and brutality. At some point, it will make you want to throw up. That’s not a defensible way to treat another sentient being. Ignoring it doesn’t make it go away. There’s one huge advantage to grain-fed meat (for the consumer): it’s cheap. Cleanup for the manure that routinely spills out into lakes and rivers. The medical bills when you get sick from that manure before it gets cleaned up. Research to deal with antibiotic resistance caused by use of preventative antibiotics in crowded farms. Corn and soy subsidies that make grains cheap. These are called externalities: costs that the food industry sneakily passes along to you. So you do actually pay for them, just not at the grocery store. But the problem is that people who buy grass-fed meat have to pay the sticker price for the cow they eat, plus all the externalities: the tax bill for cleaning up after the factory farms, researching new antibiotics, and corn subsidies. 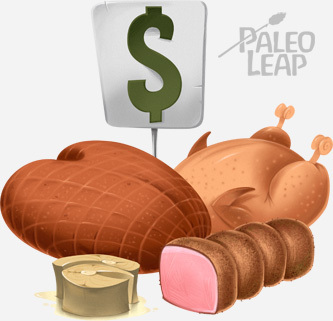 Until everyone starts eating grass-fed meat, people who eat it are paying twice. Many people can afford to pay that, or could easily afford it if they ate out less and made coffee at home. But other people can barely afford to pay once, much less twice. It’s not about giving up Starbucks or a new purse for them; if they wanted to buy grass-fed meat, they’d have to let the electricity go off or run short on the rent. If this is you, do NOT feel guilty about eating whatever you can. You are not the problem.The problem is a combination of meat industry lobbyists, corrupt government officials, outdated corn subsidies dating back to World War II, bad science, people who do have money but just don’t care, and crony capitalism run amok. You live in a food system that is violent and horrible, but the problem is with the food system, not with you. You’re doing the best you can in an unfair world, and you’re not responsible for single-handedly fixing all the unfairness that you were born into. Nutritionally speaking, it’s still better to eat grain-fed meat than to eat grains. Here are some strategies for making the nutritional best of a bad situation. Grass-fed beef is important. It’s nutritionally superior, it’s environmentally sustainable, it doesn’t breed antibiotic-resistant bacteria, and it doesn’t involve stomach-turning amounts of cruelty to animals. Unfortunately, it’s also an economic privilege. If you can afford it, support it. If you can’t afford it, please don’t take any of this as a guilt trip – it’s not. We all live in a food system that’s based on violence and cruelty from top to bottom. That food system was here before you were born, and you’re not responsible for its existence! Do what you can, and if you want to do something for free, call your elected representatives and tell them to stand up to the industrial agriculture lobby! Don’t make it more expensive than it has to be: look for budget-friendly cuts, ask your farmer about a meat CSA, and try the odd bits.